Architect: Sturt Street Buildings, Percy S Richards. Charles E Richardson Physical Education Centre and Rowena E Coutts Science Centre by Williams Boag Architects. The history of Ballarat Clarendon College is inextricably entwined with the history of the city. 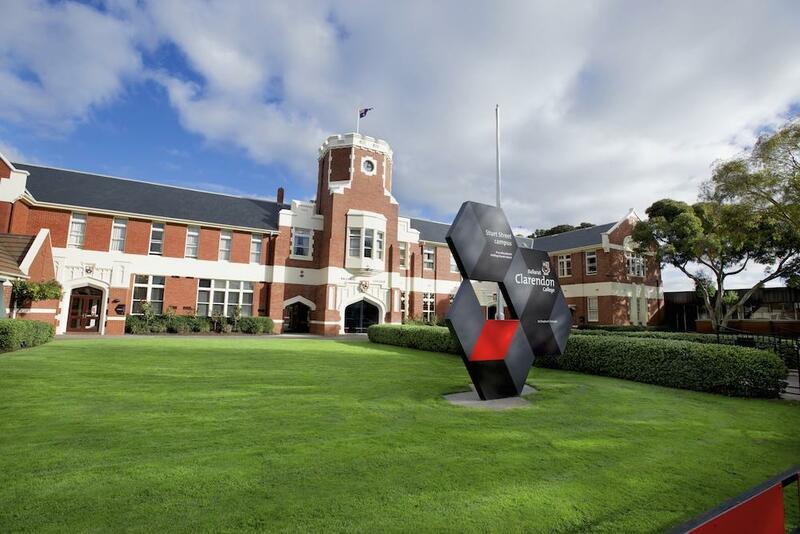 Founded in July 1864 and Victoria’s fifth-oldest private school, Ballarat College amalgamated with Clarendon Presbyterian Ladies College in 1974 to become Ballarat Clarendon College. The imposing State Significant buildings on Sturt Street were designed by local architect Percy S Richards in 1911, and the campus has continued to evolve, grow, and transform to respond to the learning needs of students in this century. Some of the College’s most historically significant buildings frame the grand entrance to the renewed Wanliss Square. This open space provides ease of access to the most-recent addition to the campus—the rejuvenated Charles E Richardson Physical Education Centre—designed by Williams Boag Architects—which includes Australia’s first moving water rowing tank, Les Mills Virtual Fitness studios, a state-of-the-art strength and conditioning room and a 25m infinity pool. Working to ensure a coherent campus, Williams Boag and MDG Landscape Architects have also created a new ‘campus heart’ adjacent to the Rowena E Coutts Science Centre, providing ease of movement and circulation to key areas across the campus. The Rowena E Coutts Science Centre itself features a Foucault Pendulum—demonstrating the rotation of the earth—a nine-metre vertical laboratory, a 90-seat lecture theatre, eight classrooms and five laboratories. What's Open: Guided tours of campus including Memorial Hall, Rowena E Coutts Science Centre, Wanliss Square, Richardson Physical Education Centre featuring the first moving water rowing tank in Australia. Campus tours begin on the hour from 10am, last tour at 3pm. Special Note: Please note: There will no longer be access to clock tower across the weekend. Tour Details: Guided campus tours will run hourly from 10am, last tour at 3pm. Queue in Wanliss Square.